For other uses, see Joachim (disambiguation). Joachim (/ˈdʒoʊ.əkɪm/; "he whom Yahweh has set up", Hebrew: יְהוֹיָקִים Yəhôyāqîm, Greek Ἰωακείμ Iōākeím) was the husband of Saint Anne and the father of Mary, the mother of Jesus, according to the Catholic, Orthodox, and Anglican traditions. 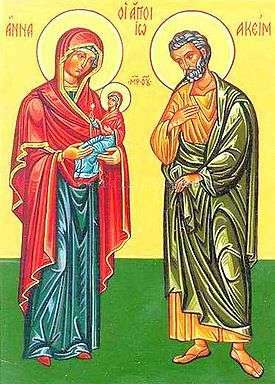 The story of Joachim and Anne first appears in the apocryphal Gospel of James. Joachim and Anne are not mentioned in the Bible. His feast day is July 26. Since the genealogies of Jesus in Matthew and Luke do not explicitly name either of Mary's parents, but apparently name two different fathers for Saint Joseph, many scholars from John of Damascus (8th century), and particularly Protestant scholars, argue that the genealogy in Luke is actually the family tree of Mary, and that Heli is her father. To resolve the problem of Joseph having two fathers - one descended from Solomon, son of David, one descended from Nathan, traditions from the 7th century specify that Heli was a first cousin of Joachim. According to tradition, Saint Anne was born in Bethlehem, and married Joachim of Nazareth, both descendants of David. In the Protoevangelium of James, Joachim is described as a rich and pious man, who regularly gave to the poor and to the synagogue at Sepphoris. Tradition has it that the parents of the Blessed Virgin, who, apparently, first lived in Galilee, came later on to settle in Jerusalem. However, the high priest rejected Joachim and his sacrifice, as their childlessness was interpreted as a sign of divine displeasure. Joachim consequently withdrew to the desert where he fasted and did penance for forty days. Angels then appeared to both Joachim and Anne to promise them a child. Joachim later returned to Jerusalem and embraced Anne at the city gate. There was ancient belief that a child born of an elderly mother who had given up hope of having offspring was destined for great things. Parallels occur in the Old Testament in the case of Hannah, mother of Samuel. Joachim and Anne Meeting at the Golden Gate was a popular subject in artistic renditions of the Life of the Virgin. The cycle of legends concerning Joachim and Anne were included in the Golden Legend and remained popular in Christian art until the Council of Trent restricted the depiction of apocryphal events. No liturgical celebration of Saint Joachim was included in the Tridentine Calendar. It was added to the General Roman Calendar in 1584, for celebration on March 20, the day after the feast day of Saint Joseph. In 1738, it was transferred to the Sunday after the Octave of the Assumption of Mary. As part of his effort to allow the liturgy of Sundays to be celebrated, Pope Pius X transferred it to August 16, the day after the Assumption, so that Joachim may be remembered in the celebration of Mary's triumph. It was then celebrated as a Double of the 2nd Class, a rank that was changed in 1960 to that of 2nd Class Feast. In the 1969 revision of the General Roman Calendar it was joined to that of Anne, for celebration on July 26. The Eastern Orthodox Churches and Greek Catholics commemorate Joachim on September 9, the Synaxis of Joachim and Anne, the day after the Nativity of the Theotokos. St. Joachim is named as the patron of fathers, grandfathers, grandparents, married couples, cabinet makers and linen traders. Symbols associated with Saint Joachim include: a book or scroll representing linen makers, a shepherd's staff for the Christian word, and a basket of doves representing peace. He is almost always clothed in green, the color of hope. The San Joaquin Valley, California was named after the San Joaquin river, which was given its name in the early 19th century by the Spanish explorer Lieutenant Gabriel Moraga. ↑ Doctrina Jacobi, written about 634; similarly in On the Orthodox Faith iv.14: Joachim's father Panther and Eli's father Melchi were brothers, sons of Levi. ↑ ""St. Joachim and St. Anne, parents of the Virgin Mary, Protectors of the Order", Carmelites". Ocarm.org. 2013-07-26. Retrieved 2013-11-03. ↑ "Souvay, Charles. "St. Joachim." The Catholic Encyclopedia. Vol. 8. New York: Robert Appleton Company, 1910. 3 May 2013". Newadvent.org. 1910-10-01. Retrieved 2013-11-03. ↑ "''Lives of Saints'', John J. Crawley & Co., Inc". Ewtn.com. Retrieved 2013-11-03. 1 2 ""St. Joachim, Father of the Most Blessed Virgin", St. Joachim Parish, Bellmawr, New Jersey". Stjoachimparish.net. Retrieved 2013-11-03. ↑ "Nelson, Fr. Lee. "Homily for the Feast of Sts. Anne and Joachim", St. John's Church, Stockton, California". Stjohnsstockton.org. 2011-07-26. Retrieved 2013-11-03. Wikimedia Commons has media related to Saint Joachim.